Engineers are currently working no serious issues with the Discovery, as the Mission Management Team (MMT) sailed through L-2 ahead of STS-119’s opening launch attempt on Wednesday. The main topic of conversation related to an issue with Discovery’s OMS (Orbital Maneuvering System) Engine Gimbal Controller during her previous flight, STS-124. The orbiter aft closeout/aft confidence test was completed on Sunday, ahead of the three day countdown picking up for the 9:20pm launch attempt on Wednesday. S0071 MPS/SSME/OMS/RCS pressurization for flight was completed over the weekend. Also completed by Sunday was the changeout of the LH SRB (Left Hand Solid Rocket Booster) command receiver decoder, which was causing an issue with its range safety communication. A successful retest has closed this issue. Currently, engineers are loading cryogenic reactants into Discovery’s fuel cell storage tanks. Only four issues have been reported since picking up the count, two of which related to human error at the pad. Only one of the problem reports required discussion – on this occasion with the flight crew. “The forward mission timer (MET) has an LED segment that is on and should be off – in work with troubleshooting of the problem. So far all troubleshooting possible has had no effect and the segment remains on,” noted processing information on L2. The main topic at the MMT meeting related to STS-124’s issue with Discovery’s Left OMS Secondary TVC (Thrust Vector Control – or gimbal) controller’s ‘failure to null in both pitch and yaw’. The controller in question was since removed and replaced during Discovery’s flow inside her Orbiter Processing Facility (OPF). No mission impacts resulted from the issue during STS-126, with the OMS 2, NC1 and de-orbit burns performed with two engines without a problem, due to the health of the primary controllers. Interestingly, the issue appeared to resolve itself ahead of re-entry. While engineers were unable to recreate the issue inside the OPF, a concern has been noted with the potential for the controller’s circuit card ability to “move”, which may have caused the problem during STS-124. The MMT discussed the findings at length during their Monday meeting. “OMS Engine Gimbal Controller Potential Circuit Card Movement: During STS-124, the left orbital maneuvering engine (OME) secondary pitch/yaw gimbal indication failed. The secondary controller was assessed to be most probable cause and was removed and replaced,” outlined the Orbiter Project’s L-2 MMT presentation (all the L-2 MMT presentations are available on L2). The system consists of two gimbal actuators (pitch and yaw), which provide thrust vector control for each of the orbiter’s two OMS engines. 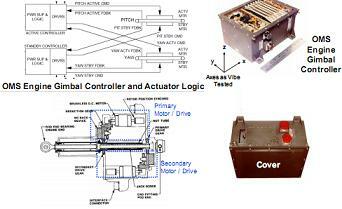 Each actuator consists of redundant electro-mechanical drive units and electronic controllers. A linear position transducer provides position feedback to the controller from the actuator. Each controller contains separate pitch and yaw channels which control power, logic and driver functions Internally, each controller contains six circuit boards, a mother board and two power inverters to dissipate heat. 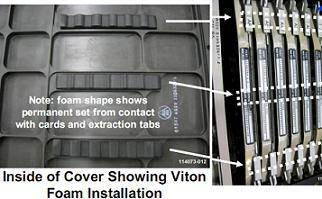 The aforementioned Viton foam rubber provides a hold-down force when the cover is installed to help maintain card pin engagement in the sockets. No other lock down feature to hold cards in place less frictional forces from the pins/sockets and card guides. During the F/A testing at the vendor, circuit assessments showed that if the A6 card (power source for the controller) was loose, it could result in failure signature similar to the one on STS-124. Thus the concern relates to the possibility the issue on STS-124 could repeat during STS-119. The MMT pre-empted the plan of action, based on one or more controllers failing during the mission – most likely during the vibrations of ascent – as part of the risk assessment. “Risk Assessment: Since failure occurred in ascent vibration, this is most likely timeframe for failure. Should failure occur after powered flight, OMS engine can be re-positioned through c.g (Center of Gravity) to prevent loss of OMS engine function,” added the MMT presentation. “OMS system is multiple-failure-tolerant for OMS controller ascent failure. One controller failure (or two in different pods): Gimbal control on affected engine remains through redundant controller. Full deorbit capability still exists: Both OMEs and +X primary thrusters. “Flight Rules direct that at first opportunity, engine re-positioned to fire through nominal EOM c.g. to protect for next controller failure. Increases propellant usage and potential for lost mission objectives. “Two controller failures in same pod: 2 other deorbit methods: (1) Other OME and (2) +X primary thrusters. Will require redlining RCS (Reaction Control System) propellant for deorbit if engine considered failed. 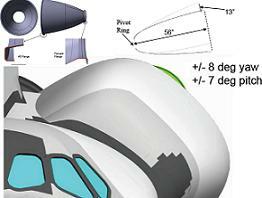 If engine parked through deorbit c.g., some extra prop usage required (more prop/less mission). “Third controller failure (loss of one OME; other still has one good controller). Still 2 other deorbit methods: (1) Other OME and (2) +X primary thrusters. If engine parked through deorbit c.g., some extra prop usage required (more prop/less mission). If OME not parked, could be Next PLS (Primary Landing Site) due to loss in deorbit redundancy. Thanks to the ability to avoid mission impacts – via a similar event to that observed during STS-124 – flight rationale was forthcoming for STS-119. 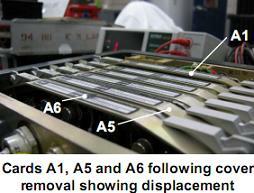 “Flight Rationale for STS-119: Identified effects of controller failure due to card disengagement are 2R3. No output from controller. Controller drives affected gimbal to stop due to loss of feedback signal. Multiple controller failures in a single flight is highly unlikely based on extensive flight history,” added the presentation. “Only single failure to date. Other controllers of similar or older age and more flights have not failed. A plan was previously created during STS-124, in the event of concerns relating to the nozzle being parked in a protruding positon, which could cause damage during re-entry. Most important, none of the potential issues that could arise from another failure would be deemed as a safety risk to the vehicle or crew.